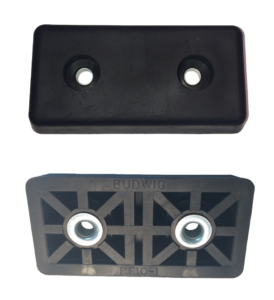 Measuring 3” in length, Budwig’s RF10-1T is one of our catalog’s biggest parts. In addition to its streamlined design, the rubber foot requires two steel support bushings for mounting to maximize support. Consider the RF10-1T for fastening that requires a heavier load. In the past, customers have attached rectangle feet to vending machines as well as indoor & outdoor furniture. Click the product numbers above to see the specifications and to see all rectangular rubber bumpers & plastic feet click here for the page for rectangular molded products. Call or email us directly to learn more about our RF-series recessed bumpers and their many applications.